New to the midsize line, the RANGER 800 EFI Midsize combines Polaris’ reliable 800cc engine with the midsize chassis for a combination that provides Big Bore performance in a smaller, two-seat model that fits in the back of a pickup truck. The RANGER 800 EFI Midsize has many of the hardest working, smoothest riding features of its full-sized counterparts: On-Demand True All-Wheel Drive with VersaTrac, Independent Rear Suspension, heavy duty front end protection, high ground clearance and the longest suspension travel in its class. The RANGER 800 EFI Midsize is perfect for any customer looking for a midsized footprint and price, with full size power. The unit delivers on the RANGER promise of “hardest working” with real work capabilities such as 500 lb/226.8 kg of cargo capacity, 1,000 lb,453.6 kg payload and 1,250 lb/567 kg. of towing. 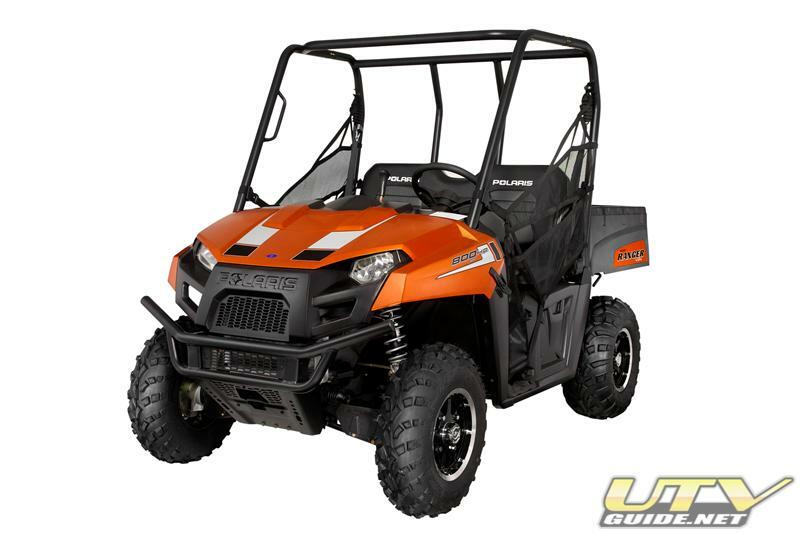 The RANGER 800 EFI Midsize’s smaller size, 800cc high output, EFI engine and lower price make it an attractive work partner for hunting, farming, maintaining acreage or doing chores around the property. 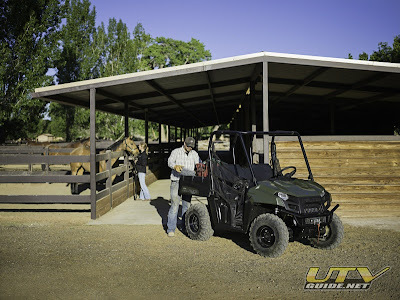 It boasts 50 horsepower offering the rider plenty of get-up-and-go to ride to that favorite hunting spot, haul feed to livestock or just take a leisurely ride down the trail. 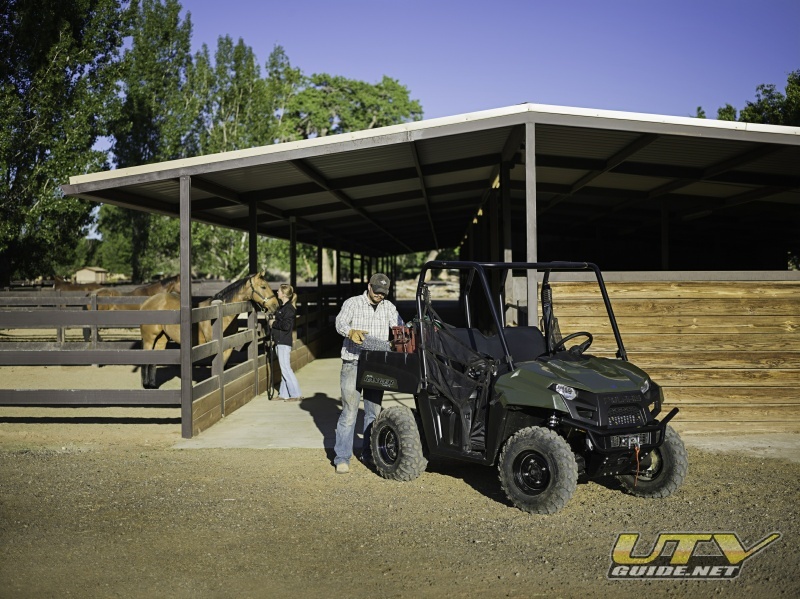 Its On-Demand True All-Wheel Drive ensures it can tackle muddy pastures or rutted, rocky hunting trails, while the VersaTrac ensures you don’t tear up the grass. With a full-line of PURE Polaris products including Lock & Ride accessories, cabs and plows, the RANGER 800 EFI Midsize can be outfitted to get any job done. To complement its hard work ethic, the RANGER 800 EFI Midsize has smoothest riding features such as Independent Rear Suspension, long suspension travel and high ground clearance to ensure a smooth ride and less fatigue on the operator and passenger, making it a true “Hardest Working, Smoothest Riding” Midsize RANGER. The RANGER 800 EFI Midsize will join the RANGER 500 EFI, RANGER 400 and RANGER EV in the Midsize class and is available in Sage Green and Polaris Pursuit Camo with a Nuclear Sunset Orange Limited Edition model. The RANGER 500 EFI is available in Solar Red, Sage Green and a Magnetic Metallic Limited Edition model, and the RANGER 400 is available in Sage Green. To round out the Midsize offering, the RANGER EV is available in Boardwalk Blue and Polaris Pursuit Camo. More information about Polaris’ whole line of Off-Road Vehicle offerings and accessories can be found online at www.Polaris.com.